Car Rental Guide for online car rental & car hire in Durban, South Africa. Competitive car hire rates. All vehicle types - sedan, 4x4, SUV, minivan & pick-up. 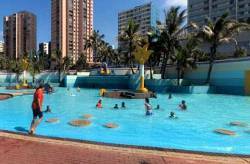 Durban is a holiday destination quite unlike any other. Sophisticated and cosmopolitan, Durban after dark is abuzz with elegant lounges, funky taverns, local theatre and live music, trendy clubs, pubs and discos. Durban is world-renowned for its "Golden Mile" - the Durban beach front. Merely a few paces from an enticing selection of international-class tourist accommodation, clean golden sands and warm Indian Ocean beckon with irresistible allure. Although Durban is viewed by most as a resort city, it offers a rich cultural heritage and history with numerous and a variety of museums, parks and gardens. Johannesburg is the prince of the subcontinent.